Obstacle Course Rentals | PartiesInc.com Vancouver WA. Watch, as contestants crawl through tunnels, navigate popup barriers and scramble up the climbing wall to reach the top of the slide. 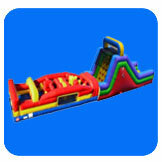 These dual lane obstacle courses are great for school fun days, church groups and company picnics. All ages can take the challenge, so they're the ideal choice for large events. Browse the selections below and click on the image or "More Info" link to get additional information and to make a reservation.